Award winning vocal trio Blake are out on tour, celebrating a decade together and headline the Lighthouse Theatre in Kettering on Monday next week. To commemorate the occasion, the group released their seventh studio album The Anniversary Album earlier this year and their current jaunt across the country is their biggest UK tour to date. 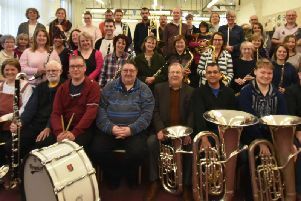 For this record, Humphrey Berney, Oliver Baines and Stephen Bowman joined forces with the Central Band of the RAF and members of the Military Wives Choirs. With repertoire chosen from the worlds of opera, musical theatre and contemporary songs, the album spans the musical worlds Blake perform during their live shows. First signed by Universal Records in April 2007, the members of Blake have been singing together around the world for more than 10 years. Born a German rock-guitar-playing father and a British opera-singing mother, Bowman studied at the prestigious London Guildhall School of Music and Drama and was one of only nine male singers to be granted a place to study singing at the world-famous college from more than 4,500 applicants. Berney joined Blake in 2009. He was the youngest ever member of Laudibus, The National Youth Chamber Choir and was awarded music scholarships to Greshams school and The University of Kent. In 2003 he was awarded a scholarship to The Royal Academy of Music. Baines began singing aged eight as a chorister at both New College, Oxford and Winchester Cathedral. He was a member of the National Youth Choir of Great Britain from 1999 until 2005 and before going to music college, studied degrees in music, music technology and briefly dabbled in Anglo-Saxon, Norse and Celtic. He went onto study at the British Institute of Florence and the Guildhall School of Music and Drama. Blake have played more than 700 concerts in the last 10 years, in the UK, Europe, Japan, Australia, China, Russia and the United States as well as performing on the likes of Graham Norton, The One Show and Strictly Come Dancing. Blake headline the Kettering venue on Monday, November 19. Tickets cost £23 before fees. Concessions cost £21.50.